Gunnar Heinsohn hopes these “torn and scattered” remnants can be “reassembled” to form a “comprehensive narrative” of an “enormous struggle” that involved the Roman Empire. If the torn and scattered sources are reassembled, a comprehensive narrative of the enormous struggle between the Roman Empire and its northeastern opponents, stretching by land and sea across Africa, Asia and Europe, can finally be produced. Personally, I don’t buy Gunnar Heinsohn’s waste disposal solution because the evidence suggests the Gothic Wars belong to the era of the Roman Republic. The Germanic Wars form a long running saga that underpins the Roman narrative. “Germanic Wars” is a name given to a series of wars between the Romans and various Germanic tribes between 113 BC and 596 AD. The series of conflicts, which began in the 5th century under the Western Roman Emperor Honorius, led (along with internal strife) to the ultimate downfall of the Western Roman Empire. The Byzantine–Lombard wars were a protracted series of conflicts which occurred from AD 568 to 750 between the Byzantine Empire and a Germanic tribe known as the Lombards. The Germanic Wars embrace the Gothic Wars between 249 AD and 554 AD. 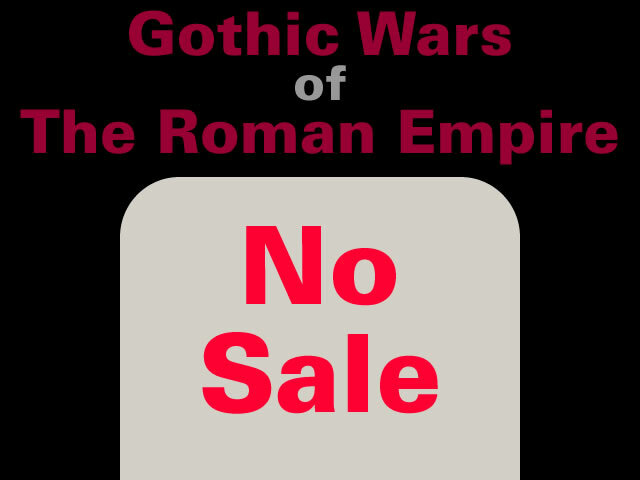 The Gothic Wars were a long series of conflicts against the Roman Empire between the years 249 and 554. The Germanic Wars also embrace the Gothic Wars of Late Antiquity between the 450s AD and 640s AD. For almost 200 years of Late Antiquity, our textbooks show Roman wars against Goths and Huns and/or Avars from Pannonia, with the names of important personalities repeating themselves between the 450s and the 640s CE and a plague epidemic ravaging Europe time and again. In the revisionist terms of Gunnar Heinsohn the Germanic Wars after the 230s AD fall entirely into the 700 Phantom Years of history between the 230s AD and 930s AD. The Gothic Wars, Gothic Wars of Late Antiquity and Byzantine–Lombard Wars all have the attributes of being phantom narratives supported by misdated [or manufactured] narratives and artefacts. This leaves the Roman Empire with an isolated cluster of narrative remnants between 165 AD and the Crisis of the Third Century in the 230s AD. These remnants include the Goths arriving at the “banks of the Black Sea” in 180 AD only to find their narrative raison d’être has disappeared into the oblivion of 700 Phantom Years. ○ c. 165 – – – Invasion of Pannonia by Lombards and Ubii. ○ 180 – – – – Goths reach the banks of the Black Sea. The more likely scenario is the Roman Empire narrative acquired these isolated narrative remnants from the era of the Roman Republic. Visually, these isolated narrative remnants neatly fill the gaps in the Roman Republic narrative. These isolated narrative remnants appear to belong to the Crisis of the Roman Republic where there is a suspicious [and very welcoming] lack of detail between 133 BC and 90 BC. Relocating the Goths to the era of the Roman Republic is supported by the epigraphic evidence that suggests Diocletian and the Constantinian Dynasty belong to the 1st or 2nd century BC. Overall, the consolidated storyline indicates the Germanic Wars and the Crisis of the Roman Republic were triggered by the catastrophic events surrounding the Arabian Horizon that’s centred on 637 CE. But, as always, readers are encouraged to review the evidence and draw their own conclusions. Gallery | This entry was posted in Arabian Horizon, Catastrophism, Epigraphy - Inscriptions, Heinsohn Horizon, History, Old Japanese Cedar Tree. Bookmark the permalink. One of the main beliefs was of what can be called ‘Circular Time’. Polybius wrote about this at length. Thus, if something exists today(or in the near past) then it was essential that the same events had played out, very similarly, in the past. And preferably on multiple occasions as well. This actually goes all the way through to the ‘Renaissance’, where the Religious Disputes of the time exactly correspond to the Religious Disputes of the 3rd and 4th centuries. This may also explain the ‘Medieval ignorance’ where painters of the 15th/16th centuries would depict scenes where people from “entirely different” eras would be painted together. Quote from above post ““History was made designedly to repeat, in an imagined past, the events of the real present.”. Not only. As Xenophanes said “men created the gods in their own image”. Most everything is pictured in what is the present experience of things, projecting backwards modern experience (and behaviour/atitude) into prehistory. Someone, I do not recall now, once remarked ‘that the past is a foreign land and people do things differently there’. The only practical effect is to shorten th period of “progress” and perhaps explain that catastrophe is far more frequent than we are led to believe: “keep the sheep calm”, perhaps? We now seem aware that Grand Minima may mean more than just poor weather?